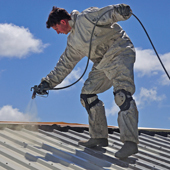 ﻿Using our four stage process, specialised, airless spray equipment, long-life coatings and Homeshield's technical ﻿expertise the roof is thoroughly cleaned down and repaired prior to the spray application of the durable top coat. All tiles are thoroughly cleaned by high pressure water jetting to remove all traces of moss, algae, lichen, pollutants and carbonation. 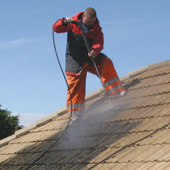 All gutters are cleaned inside and out to remove all traces of silt build up. Great care is taken not to block existing downpipes. A bio degradable detergent is applied to impregnate existing surfaces to eliminate any underlying active infestation of moss & lichen spores. This will retard any future re-growth in years to come, preventing any underneath spoilage to the finish coating. All defective mortar between crests, ridge and hip tiles is hacked out and re-pointed using a fibre reinforced polymer mortar. Any loose ridges, crests etc are re-bedded. 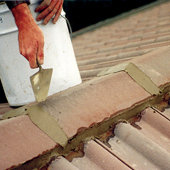 All broken, damaged or delaminated roof tiles are replaced using same or similar profile. Any damage to mortar verges is re-sealed. 2 top coats applied by specialist airless spray equipment in customers chosen colour. 1st coat applied and allowed to dry (please note: drying time dependant on temperatures at time of installation). A 2nd coat is applied to give a finish of a newly installed roof. 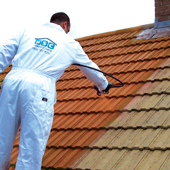 Following completion, your property will be left in a clean and tidy condition.